Status: Bluetooth and USB Serial connectivity between UWP app and Arduino device implemented. It reworks the SerialTerminal.xaml XAML page and its codebehind page SerialTerminal.xaml.cs form the IoTCoreMenu project within that repository project. Code now on GitHub. Look at the Pages/USBSerialTerminal.xaml.cs page. 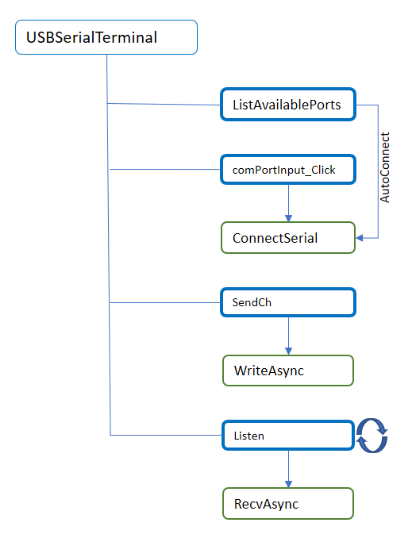 When used as the connectivity between the UWP UI app an the remote app (sketch) on an Arduino device, connectivity is straight forward as the USB cable used to download the sketch from a development machine, and to also power the Arduino device, can also be used as a USB Serial conduit. * Silicon Labs Chipset (eg CP2102EK USB-UART Bridge Eval Kit) was supported and worked for me then. Subsequently support for FTDI chipset was added to IOT-Core and the native UART (UART0) was also added. So if you want to implement USB-Serial from a RPI to a desktop/laptop etc., you need to implement the USB-Serial at both end of the connection. At the desktop and at RPI. You may plug a USB-Serial dongle (eg FTDI ) into both ends and connect their DB9 with a serial crossover cable. Not as simple as with the Arduino device. Or you might use, say, a SparkFun USB to Serial Breakout connected to the RPI Tx and Rx 3.3V UART0 signals on Pins 8 and 10 respectively into RS232 Signals encoded in a USB connection that can be plugged via cable in to a desktop USB 2/3 Host port. The outline of the connectivity code follows. The State Machine for the connectivity is covered elsewhere in these articles. The USBSerialTerminal page method ListAvailablePorts gets a list of serial devices from a query to the DeviceInformation class. That list is filtered on the DeviceId string that accepts strings that include USB or FTDI. This removes and Bluetooth serial devices. 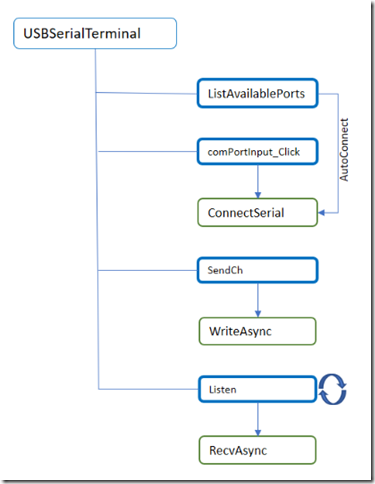 If there is only one device in the list or if a Device Id is listed in the configuration data then it is automatically opened. ConnectSerial opens the serial port and sets its serial configuration. It can also automatically start the Listen thread. The WriteAsync method takes as string and asynchronously writes it to the DataWriter which was created from the SerialPort OutputStream. The Listen thread repeatedly calls the RecvAsync method. The RecvAsync method creates a Task from the DataReader which was created from the SerialPort InputStream. This thread awaits the reception of bytes by the DataReader that are then read into a buffer where they can be processed, for example into a string. // ..if device Id (disi.Id is listed in the Json Configuration data. // .. or if only one device connect to it. The connectivity is the same as the desktop UWP code.